If you need to remodel a bathroom at your home in Minneapolis, Minnesota, know that U.S. Patio Systems and Home Remodeling is a local business you can rely on to provide professional bathroom remodeling services that will exceed your expectations. Our company, which is an authorized service provider for The Home Depot, can remodel a bathroom in your home so that it becomes a beautiful, welcoming retreat. We can install a replacement bathtub, new shower, flooring, light fixtures, cabinetry – anything necessary to give your bathroom a professional makeover. We can even install a walk-in bathtub if you believe that, either as a result of your age or mobility restrictions, continuing to use a conventional tub or shower is a risk to your physical safety. 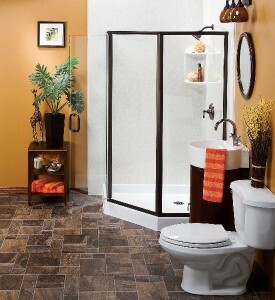 High-quality products – We carry bathroom remodeling products from industry leading manufacturers, such as bathtubs and shower systems from Bathwraps that are constructed of nonporous acrylic, resistant to mildew and mold, and available in an immense range of styles and colors. Great service – Our installers possess detailed knowledge of our bathroom remodeling products and installation procedures, and are committed to leaving you 100 percent satisfied with their work. Superior value – By allowing our team to remodel a bathroom in your home, you will receive professional installation of attractive, well-made products that we believe provide the best value for your dollar. Contact U.S. Patio Systems and Home Remodeling today if you are interested in having us remodel a bathroom in your home in Minneapolis, MN. We will gladly provide a free in-home consultation.